If you have limited time in Krakow we have special offer for you. 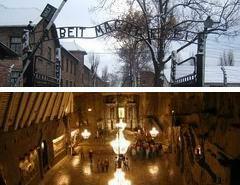 You can visit Salt Mine in Wieliczka and concentration camp – Auschwitz Birkenau in one day. Our English speaking driver will pick you up from the hotel or any given adress. Auschwitz-Birkenau and Salt Mine tour takes about 10 hours but it’s your private tour and you can spend there as much time as you wish. Whether you decide to leave early or stay longer – our car will be waiting for you. We recommend to leave Krakow somewhere between 8.00 and 10.00 am to make the whole tour manageable and to give you enough time to go through this places, but we are flexible. Firstly the driver will take you to Auschwitz museum. There you may have a tour with a guide or you can visit Auschwitz-Birkenau museum without guide (visiting Auschwitz-Birkenau is free and you have no limited time), it’s your choise. You can spend as much time as you wish in Museum Auschwitz (it’s yourprivate tour – our driver and our car exclusively for you). Our driver will be waiting on the car park during the whole tour (the trip includes also visit Birkenau). 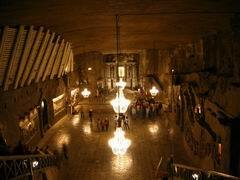 After visiting Auschwitz & Birkenau we will take you to Wieliczka, where you can see Salt Mine. Before visiting this place we recommend you a lunch in “Halit” restaurant (restaurant with Polish traditional food). Tour with a guide starts at 3pm 4pm and 5pm. After tour our driver will take you back to Krakow, to your hotel or any places in Krakow. In case you can’t send booking form, send us e-mail please – info@aroundkrakow.co.uk with information: your name, number of people, hotel name, date and time of tour. If you have limited time in Krakow we have special offer for you. You can visit John Paul II Route (Wadowice and Kalwaria Zebrzydowska) and concentration camp – Auschwitz Birkenau in one day. Our English speaking driver will pick you up from your accommodation. Then he will drive you to Auschwitz (the best time to go there is about 9.00am, but we are flexible). You can spend as much time as you wish in Museum Auschwitz (it’s your private tour – our driver and our car exclusively for you). Our driver will be waiting on the car park during the whole tour (the trip includes also visit Birkenau). After visiting Auschwitz & Birkenau we will take you to Wadowice, where you can see John Paul II museum and to Kalwaria Zebrzydowska where pilgrimage park is. Then we travel to the Sanctuary of Divine Mercy in Łagiewniki. You can pay tribute to the holly relics of St. Faustyna Kowalska, who was canonised as by John Paul II, and admire the impressive modern basilica consecrated by the Pope in 2002. After tour our driver will take you back to Krakow, to your hotel (if you wish our driver can stop for a lunch). 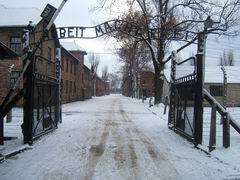 Auschwitz Concentration Camp is probably the most shocking remnants and a 100% proof of the Nazis World War II crimes. It paints a clear picture of Nazi regime and conditions in which millions of Jews were kept until boarded the train with unknown destination. 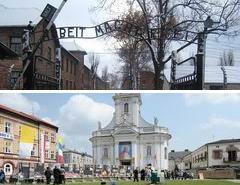 “Arbeit Macht Frei” (Work makes you free) entry emblem – since 1979 has its place on the UNESCO World Heritage List. Although one of the most unpleasant – a must-have experience and a must-visit when in Krakow, Poland. We will arrange for you a private transfer/tour to Auschwitz (the trip included also visit Birkenau) We recommend to leave Krakow somewhere between 8.00 and 12.00 but we are flexible as the afternoon Tours are also avaliable. Our English speaking driver will pick you up from the hotel or any given address and he will take you to Auschwitz camp first. If you wish you can visit Auschwitz on your own (free of charge) or you can join to the English guided tour – please let us know and we will arrange it for you. Auschwitz-Birkenau tour takes about 6 hours but it’s your private tour and you can spend there as much time as you wish. Visiting Auschwitz from the 1st April until 31st October is payable from 10:00am until 3:00pm. – must be accompanied by a museum guide. 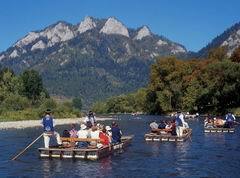 The fee (includes guide service) is 60zloty (reduced fee 50zloty). If you wish to visit Auschwitz on your own (without a guide – free of charge) I suggest to be picked up from the hotel at 08:15am. or at 1:00pm. We will arrange for you a group tour to Auschwitz (the trip included also visit Birkenau). Our English speaking driver will pick you up from the hotel or any given address between 08:30am and 09:30am. Sharing with other people in the minibus. The way by car/minibus from Krakow to Auschwitz takes about 1h drive. The English guided tour starts at 11:00am. The guided tour takes about 2h at Auschwitz, 1,5h at Birkenau. Back to Krakow between 3-4pm. If you’d have any other question or suggestion regarding your trip to Auswitch please feel free to contact us. The famous 1993 ‘Schindler’s List’ starring Liam Neeson and Ben Kingsley was in fact shot right here in Krakow – the actual premises of Schindler’s former factory near Lipowa Street. Factory Exhibition still features special themes and raises important issues – divided in few sections the museum consists of photographic and video sections – actual archives and radio recordings. It’s an important part of history not to be missed when within reach. With us you can visit Schindler’s Factory on the tour with the Auschwitz-Birkenau Museum or Wieliczka Salt Mine. 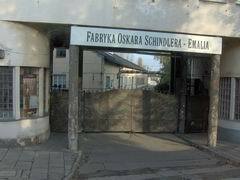 Admission fee to the Schindler’s Factory costs additional 15PLN/4EUR per person. 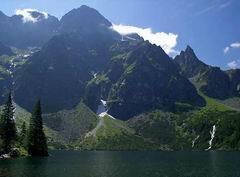 The difference between Zakopane Tour and Zakopane Transfer is that Zakopane Tour service is more tailored to your personal needs. All tours are custom and customer-focused: Whether Skying or Sightseeing – our driver is at your disposal all the time during the Tour. In this case we select the most knowledgeable drivers to be your guides as well. Familiar with the background of Gubalowka Mountain, Kasprowy Wierch and the city’s finest Krupówki – where you can obtain one of a kind highlander’s crafts at the local market. All prices are in Euro (€) / Polish Zloty (zl) per person. Częstochowa is a very special place not only for Polish people, but but for every Christian. It’s been the location of one the most sacred painting of Black Madonna a place of a most fervent cult of Virgin Marry. She’s been called the Queen of Poland for centuries and the painting’s power is being turned to everyday. Pilgrimages to the painting are being organized throughout the year and to take one is considered to be very important in soon-to-be college students life. The city role in Polish history cannot be underestimated since it was the famous defense of Czestochowa that kept the country a whole in 1655 when the Swedish Invasion struck. Jasna Góra has withstood a heavy artillery fire, which has been considered a miracle ever since.